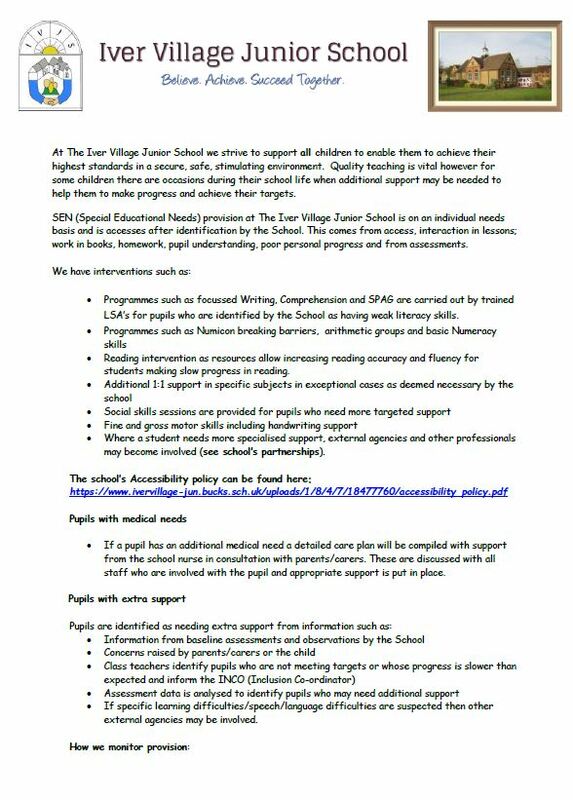 At IVJS we recognise that all pupils have individual needs and that some pupils will require additional support. All pupils are regularly assessed not only to track progress but also in order to detect if any learning difficulties are present. Once special needs are identified, the Inclusion Manager liaises with class teachers, parents and outside agencies to ensure an appropriate response. There are many different types of special needs presented by children and, depending on what they are and the level of seriousness, the special provision varies. The initial stage of additional support is called SEN Support. Children receive additional time up to 13 ½ hours, at least twice a week to work on individual needs in a small group/1:1 setting either by the class teacher, LSA or INCo. Other pupils receive specialist support as required: Speech and Language Therapy, Physiotherapy, Hearing or Sight impairment support or Primary Resource Unit (PRU) are examples. In addition, most pupils will receive in class support at least twice a week from an LSA or class teacher. Nearly all Literacy and Numeracy lessons in our school have an LSA allocated to them so those small groups can be targeted. If we feel a child requires more input and support we will request a formal assessment from Buckinghamshire County Council and, if deemed appropriate, receive an Education and Healthcare plan. Pupils with an Education Health Care Plan receive the hours of support outlined in their plan. Often this is delivered flexibly between LSA and class teacher time, individual and group teaching. It is not always appropriate for one child to receive 1-1 support for the majority of their lessons in order for them to learn independent work skills; sometimes ‘distant’ support is best. This also helps to include the child as a full member of the class rather than taught in isolation. Because we use a variety of small groupings children are made to feel included in their learning. There are ‘booster groups’ for children, who benefit from an extra push, special needs groups and setting for Numeracy. The school aims to identify those children who find learning more difficult for whatever reason. We aim to work with parents to develop a supportive partnership to enable their child to achieve their potential. Should you have any concerns about your child’s learning needs please contact your child’s class teacher or Mrs Sarah Chapman-Allen (Inclusion Manager) on the school number, 01753 653 059 or by using the contact us form.